The graphic novel A.D.: After Death by Scott Snyder and Jeff Lemire is an ambitious beast. Combining prose and graphics, this is a wonderful graphic novel which explores death, its cure, and what it all means for a man named Jonah, who was there to witness it all. This is a graphic novel in the most literal sense of the word. The more standard comic book cells are a bit sparse, largely only appearing in the ‘modern day’ sections of the story. This method of differentiation works quite well. It is apparent what time period the story is currently in without needing dates and times plastered in large lettering at the tops of pages. Sections of the graphic novel which talk about the past are largely told in prose and pictures, foregoing the traditional comic book pages readers are most familiar with. Lovely watercolor pictures are included with paragraphs, sometimes full pages, of prose. While a more unconventional approach, I think this format worked very well for the story. The prose and art complimented one another perfectly. Despite having more text, particularly more descriptive text, the art never felt unneeded. A story was still told through the art alone; it added a great deal to the story. I really enjoyed the formatting of this graphic novel. The prose was very beautiful. I’d most definitely read a more traditional novel written by these authors. The art was also beautiful, and I really loved the traditionally formatted section of the graphic novel. However, I do think that the flipping between comic book and novel throughout the text may annoy some readers. Purists of either format may find themselves wishing that the work would simply stick with one after the other. Conversely, I think this book is a very good work for readers of either graphic novels who want to dip their feet into traditional novels or those who have never read a graphic novel and want to begin reading in the genre. There are many science fiction tales involving humanity curing death and finding immortality. None have used it in this way. Despite having a cure for death, there are very real consequences and . The human body, despite longevity, still has limitations. Only one lifetime of memories can be held. Loved ones, important life events, your own childhood is forgotten over time. Some people find this a sort of blessing. There is always another chance to start over – a fresh start will always be on the horizon. The earth itself is changed as well. The world Jonah was born into is gone, forever changed due, in part, to his own actions. As changed as it is, this world is largely an unknown. Between memories resetting every hundred or so years and the inevitable secrets being kept Jonah, and by extension the reader, knows very little of this dangerous world. Fascinating as the world the creators build is, we don’t necessarily see a lot of it. The majority of the story tells the history of Jonah, as recorded in the journals he keeps. The motivations he has and the fears that drive his actions are both very human. It is easy to see how his actions are motivated, and easy to sympathize with him. Jonah is a character who grows, though. Throughout the course of the story he changes, or at least makes an effort to change himself and the world around him. An interesting concept touched upon in the story is how, over the course of these hundreds of years, characters change and stay the same. With no memories past one hundred or so years, people have the ability to vastly change. At the same time, there are ways they seem to not have changed very much at all. This graphic novel is one that I greatly enjoyed. It is longer than many other graphic novels. With the considerable amount of prose, it does feel a bit dense. At the same time, the entire story is contained within one beautiful, hardcover volume, something that isn’t very often seen. The story told is engrossing, spanning centuries. By the end I found myself quite attached to Jonah, and sympathizing with his plight. While I wish the future world was more overtly shown, I do understand the decision not to have the longer, more action-y sequences. 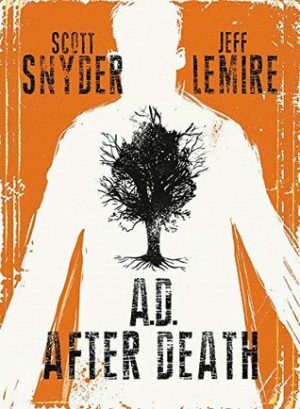 A.D.: After Death by Scott Snyder and Jeff Lemire is a graphic novel I highly recommend. The art is beautiful; the prose is lyrical. The change in formatting, while perhaps distancing itself from some readers is sure to pull many more in, and, more importantly, was perfect for the story being told. After reading this digitally, I will surely be looking to find a physical copy for my shelf.